Our Upper Elementary builds upon the foundational skill set that developed in the Lower elementary program. The UE program encompasses students who are 9 through 11 years old, or grades 4-6, and once again the multi age grouping is of the utmost importance. At this age, the child has a great capacity to learn consciously and deliberately, to reason and to memorize. This is the time for gaining the rudiments of advanced disciplines: higher math, geometry, chemistry, physical and biological sciences and further development of grammar and syntax. 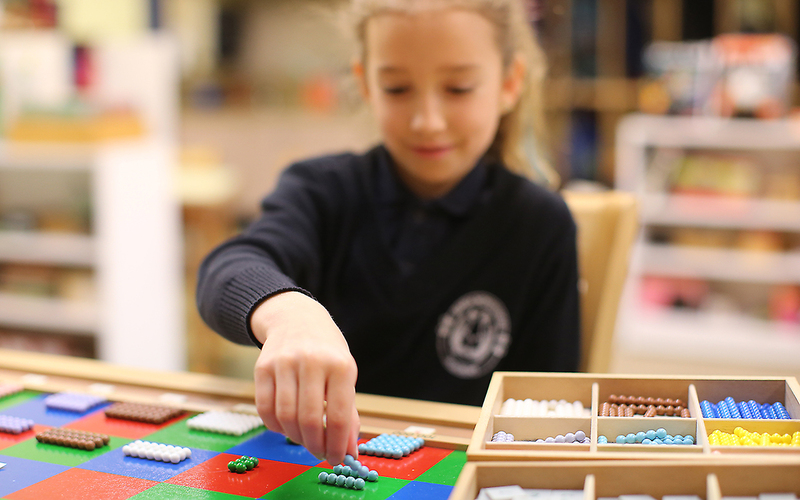 Classifications, sequences, consequences and applying knowledge to specific tasks provide these children with wonderful sources of understanding and allow for the development of essential skills such as critical thinking and problem solving. Individual presentations, small group lessons and individual research allow for experiential learning and fulfill their need to know the reason for things. If you would like to learn more about Maria Montessori Academy in person, please Request a Tour.